Messy and weird and I love it. Sometimes it takes a few rough edges to make something memorable. It’s not the pearly white clean “by the book” things that stick in our minds, no they are far too ordinary, we remember the rough things that challenge us. Dr. 2 is not a clean thing by any stretch of the imagination and it’ got faults and flaws a plenty but it sticks in your mind and you can’t help but wonder if the little things were not intentionally stabbed like a needle in your brain to catch your attention. A little background. Dr. 2 is done by two VFX artists and I can almost see it in the way this is made. It is drawn with a janky, grayscale, hyper stylized approach that draws heavy inspiration from film noir. The deformed faces and rough brushstrokes the comic is drawn in plays to the overall tone of the comics and really captures the aesthetic they are going for. Sometimes this makes it difficult to tell what is going on and they throw a LOT at you real fast and to be honest- I didn’t catch everything with just one read through. That is not a compliment because I felt pretty lost by page 20 and key points got lost due to some points that are mentioned early on that get resolved later. Some sleight lettering/dialogue balloon mistakes are actually gambles that didn’t pay off. For example, on page 28 we have the driver of a car turning a radio on but we can’t see it so we have an arched bit of text that says “Radio On” with a curving arrow indicating that the character is turning it in that direction. Visually that works and is kind of novel, however the arrow has this issue that occurs in Adobe Illustrator when you try to curve a line and then apply a stock arrow style to it as a stroke where it oddly warps the traditionally straight tip. I know I’m getting technical here but for what is otherwise a great comic- little things like that get in the way of really pushing it up to the next level. It’s more a “death by a thousand papercuts” kind of thing that drags the production quality down and most of it could simply be reworked and repaired (provided they kept the layers separate). The contrast used in the comic is undoubtedly the best use I’ve seen in an indy comic and reminds me of Samurai Jack fighting the Ninja. It fits with the “shades of grey” sense of morality to get and pays homage to the kind of detective flicks that this reminds me of. There is a very compelling story to be told here and it is currently sitting in a bunch of pieces like a puzzle sitting on the floor. It’ll probably take a few issues (well… no doubt a series) to sort itself out and I gotta admit I’m pretty hooked. I’d love to see the ways this fit together. The characters were mysterious yet familiar enough in their roles that it was genuinely enjoyable to spend some times in this little world Dr. 2 has created. As a heads up to younger readers, this comic probably should have an NC-17 rating on it but if you are of age- give it a read! This entry was posted in Comic Reviews and tagged comic review, comics, Dr. 2, independent comics, indie comic review, issue #1, James Chiang, new comic, Peter Tieryas, scott gladstein, scottyg. Bookmark the permalink. 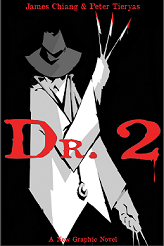 A great and balanced review of Dr. 2 at the Indie Comic Review. Thank you Scott! “The contrast used in the comic is undoubtedly the best use I’ve seen in an indy comic and reminds me of Samurai Jack fighting the Ninja. It fits with the “shades of grey” sense of morality to get and pays homage to the kind of detective flicks that this reminds me of.